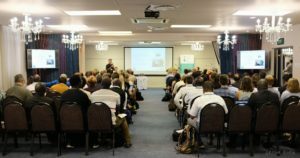 More than 100 participants attended the Future Climate for Africa (FCFA) conference in Cape Town, South Africa. The primary goal of the conference was to facilitate exchanges on scientific progress of the programme spanning climate variability and change, various sectorial applications, and approaches to piloting novel climate services. It was an opportunity for the FCFA research community to deepen collaboration and learning to contribute towards the resilience of African communities to weather and climate change. The majority of the four-day conference was devoted to showcasing progress on a wide-ranging research agenda that promises a step change in African climate science and its applications. Keynote addresses and plenary panel discussions offered provocative snap shots of progress, challenges and opportunities, whilst poster presentations and thematic breakout sessions offered substantive technical exchanges to progress collaboration. A major highlight of progress on African climate science includes work being conducted by the IMPALA consortium on the first ever pan-African convection permitting, 4.5km resolution regional climate simulations with the Met Office Unified Model. The new high-resolution simulations are underway and are showing more realistic representation of convection, reduction in rainfall biases and a range of other improvements in modeling realistic physical weather processes for the African continent. Scientists from across FCFA are now accessing and analysing the CP4-Africa simulations. Dr Chris Taylor from the Centre for Ecology and Hydrology Wallingford shares highlights of scientific progress in understanding west African climate. 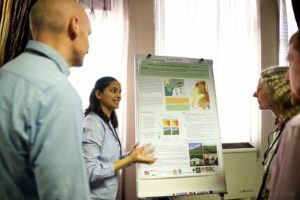 More than 30 poster presentations showcased advances in various areas of understanding regional African climate processes and how models simulate climate and climate change. 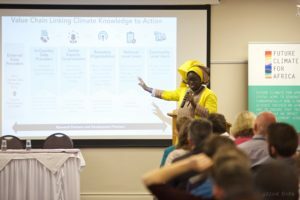 Breakout discussions also furthered collaboration on evaluating climate models with an “African lens”, including proposals to share not only research results, but code and diagnostic tools. This promises an opportunity for African scientists to take a lead in contributing to global climate model evaluation infrastructure whilst advancing the skill of African forecasts. 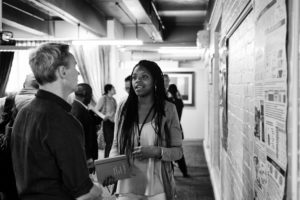 The FCFA research community was challenged to make the link between scientific research and engagements beyond the academic sphere with the eye on demonstrating real development impact. To this end FCFA partners are piloting the use of climate information in novel climate services in 11 pilot projects across Africa. Several breakout groups and a further 20 poster presentations focused on progress in applying and tailoring new (and existing) climate information in various geographic and sectorial contexts, including urban planning, water resources management, and rural livelihoods. Discussions covered impact studies (such as flood and crop modeling), policy analysis, understanding the “decision contexts” of specific adaptation decisions, and novel approaches for co-production of climate services. Neha Mital from Leeds University presents her work on Climate Information for Resilient Tea Production in Malawi and Kenya. There was general agreement that whilst it is too early in the programme to demonstrate practical developmental impact (through for example changes in planning, financing or policy decisions), there has been a marked difference in how climate information has been introduced into particular African contexts and integrated into specific development decisions. Collaborative learning sessions facilitated the development of the FCFA Impact and Legacy strategy, linking the work of individual researchers, work packages and consortia to the ultimate intended outcome of the research programme: Reduced disruption, damages and fatalities from climate today and in the future. “I found the conference really useful to learn about other FCFA research, and from everyone’s expectations, successes, limitations and ‘failures’.” Said Dr Lulu van Rooyen from the City of eThekwini (South Africa) Environmental Planning and Climate Protection Department. The City of eThekwini is a self-funded partner to FCFA piloting the use of “learning labs” to integrate climate information into city planning processes. Dr Arame Tall from the Global Framework for Climate Services delivers a keynote address on Emerging African Needs to move from Climate Research to Operational Climate Services. Photography by Gregor Röhrig (www.gregorrohrig.com) . A photo narrative of the event can be viewed here.